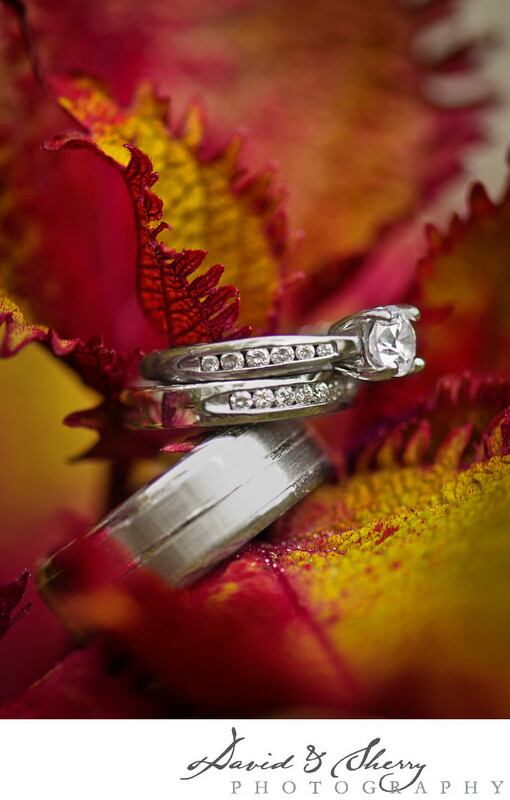 When we are approaching how to take stunning wedding ring detail shots at weddings we are looking for interesting details and parts of the decor that will compliment the beautifully custom designed rings that our clients so often choose to adorn their ring finger with. The ring detail is just part of the wedding day that adds to the overall finished album. This particular photo took place during a wedding at the Shangri-La Hotel in Vancouver. This is a resort which specializes in smaller boutique and intimate weddings in Vancouver by providing a stunning space for 10-110 guests and provides several different spaces for the various parts of the wedding day. The ceremony takes place on the Terrace while the reception is held in the Conway Ballroom and the Tea Ceremony is held in the Library. This helps to separate the sections of the day and add luxury and sophistication to your wedding design. Located in the heart of downtown Vancouver the Shangri-la is in the perfect location for your intimate high class Chinese wedding as it is close to everything and gives you the luxury of the big city with the feel of still being in the mountains on the edge of the Pacific Ocean. Location: 1128 West Georgia Street, Vancouver, B.C., V6E 0A8, Canada.